I haven’t been able to find the figures for any elections before 1983, but I’ve read that the number of retirements in 1987 was, at the time, a post-war record. 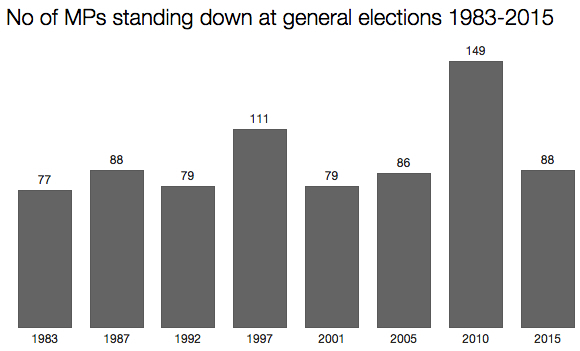 A total of 757 MPs will have stood down from 1983 to 2015 election: over 100 more than the entire number of MPs in the present House of Commons. There’s still time for the figure for 2015 to rise higher, of course. I doubt it will reach three figures, but even one more name would make 2015 the third highest exodus since the second world war. Notable that the largest number of retirements were in years when a change of government was on the cards (1997 and 2010). MPs saw the writing on the wall and decided to jump before the electorate pushed them (and gave themselves a head-start in looking for a new job). Will any party get more than 300 seats?